Note: This is the second half of a two part example. We recommend you check out part one first, especially if you’re just getting started with Hover. In part one we looked at how to automate a USSD Send Money transaction with the Hover SDK. For many types of USSD sessions, especially a financial transaction like Send Money, you also want to know whether or not the payment was successful, and to access details like the confirmation number and amount paid. In this post we’ll explore how to use Hover’s parsers to access important details from a confirmation SMS message. Parsers allow the SDK to structure this information and make it available to your app. Instead of asking your users to pay and send you a confirmation code, you can match users and transactions from within your app. 5JC4XXXXXXX Confirmed. Tsh100,000.00 sent to 255765555555 - USER NAME on 12/10/18 at 4:15 PM. New M-Pesa balance is Tsh14,500.00. Notice that we use valid Java identifiers for named groups — this will be important in the next step. It’s often helpful to copy the exact text of the confirmation SMS into a Java regular expression tester (at Hover we like Regex Planet), but any Java-compatible regex editor should work. Paste this regular expression into the “Regex” field of your new parser. 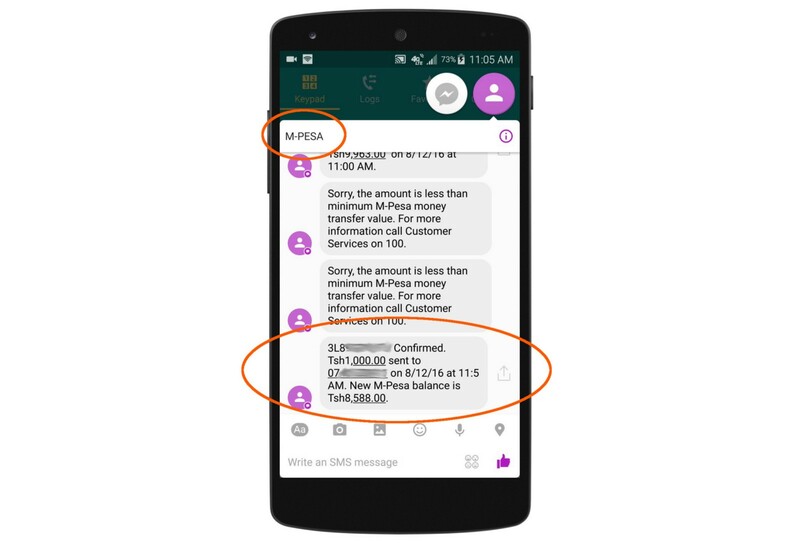 For “SMS Sender’s Number”, enter the sender ID exactly as it appears on a phone, here “M-PESA”. Click save, then head back to your IDE. You can read more about Hover parsers and regular expressions in the docs. When an incoming SMS matches the regular expression and sender ID from the parser in the previous step, the TransactionReceiver receives an intent broadcast by the Hover SDK. This intent contains several useful extras, including a serialized HashMap extra called transaction_extras. Each key in the HashMap is one of the named capturing groups in the regular expression above. You can use this information to confirm a transaction and update your user, confirm a purchase, or do any other business logic. A successful match also means that the status of the transaction will change from “pending” to “confirmed” in the Hover dashboard. See the docs for more information, including the full list of extras sent to the TransactionReceiver. If you’ve read this far you understand how to automate a USSD session with Hover, and then use data from the result in your app’s code. Regular expressions can be cumbersome and not every Hover app needs parsers, but they can help you access session details that aren’t otherwise available programmatically. We’re excited to allow developers to maintain end to end control over the user interface of an app, even when integrating services that are only available via USSD. Don’t have a Hover account? Sign up and get started for free. USSD automation for developers. Integrate any USSD action from any operator into your Android app.